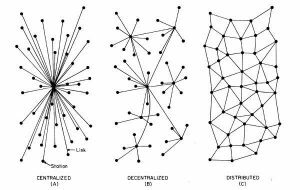 What does Centralized vs Decentralized mean in the enterprise context? As explained in the above image, the key difference is in that centralized systems are controlled centrally. This could be a decision-maker or a group. This could be a computer server or database with business logic that controls certain assets and/or processes. Blockchain provides you with free open-source technology that allows building decentralized economy principles into your products, services, and interactions with customers or partners. Added value advantage is TRUST associated with decentralized architectures. In other words, this allows businesses to operate in “trustless” environment. Lack of trust often blocks the business from happening. Especially if parties don’t know each other. Thanks to unique decentralized features such as distributed ledger and smart contractsblockchain enable parties to successfully interact and do business without having to know or trust each other. In addition, decentralization introduces other advantages such for example as higher availability of products and services due to the absence of a single point of failure. What could be the use cases? You guessed it – Bitcoin is based on the same concept. It is a fully decentralized system. Bitcoin issuance and exchange rate are not controlled by any government or corporation. Bitcoin owners do not need bank accounts, effectively every node of the network is a “bank”. The same concept could be applied to other types of assets, both real-world and digital. Sometimes this is called tokenization of assets. Imagine a group of banks or other organizations (mobile carrier, for example) that need to settle their mutual balances from time to time and/or create mutual financial instruments such as credits. In a conventional approach, each of them would need to keep own ledger and follow a tedious process of reconciliation on regular basis. With the decentralized approach, parties could deploy a private blockchain network where each of them hosts a node of the network. This distributed ledger is controlled by a group but cannot be tampered with by just one member of the group, and therefore can be trusted and used for automated settlements. A system rewarding equipment owners for work done by their equipment. In typical leasing model, the owner of equipment has to rely on equipment used to pay them on monthly basis according to contract. In the blockchain system, a smart contract could be set up to automatically release payments according to how much the equipment has been used. Asset tracking & proof of transaction. In supply chain context decentralized system helps to make sure certain shipment has passed through certain points A, B, C at a certain date and time. For logistics use cases it is important to provide all parties with reliable information. Imagine shipment leaving a point of origin A, being stopped at border B at which point another record is made on blockchain with current date & time signed with private key relevant for this milestone. This provides all participants (supplier, customer, auditor) with the reliable and immutable log of what has happened to the shipment and when. A similar approach to the above can be implemented in Healthcare context in relation for example to insurance audit. Certain doctor issues digital messaging instruction to a nurse to carry out a specific operation. The instruction is logged onto distributed blockchain network with similar nodes being run by other hospitals and government controller. In case of any legal or insurance claim, an audit can be easily carried out over what has been done and when. Note: blockchain does not solve the problem of data which is false at the origin. It only helps to ensure the data is not tampered with afterward. c) increasing liquidity through tokenization of assets. Please feel free to contact Dappros to obtain a free consultation on how decentralized blockchain technology can be leveraged in your business context.